Enterprise Application Integration | Batish Technologies | Batish Technologies Pvt. Ltd. Enterprise Application Integration – Batish Technologies Pvt. Ltd.
Enterprise Application Integration (EAI) is an integration framework composed of a collection of technologies and services, which form a middleware to enable integration of systems and applications across the enterprise. The integration troubles many enterprises face today are due to the fact that until relatively recently there was no expectation that applications should be able to ‘communicate’ to each other. In today’s business surroundings it has become essential for enterprises to make widespread use of computer systems and applications in order to create and maintain an aggressive benefit. However, if these applications and systems are to provide the preferred gain it is very important to ensure that their resources are accessible to all users and business processes that may gain from them. Regrettably, these applications are not fully integrated within an organization, preventing the seamless flow of information throughout the enterprise and forming ‘information silos’, or pooling of information resources. Data Integration– EAI is available with built in application programming interfaces (APIs) by that in may successfully communicate with otherwise incompatible legacy systems, eliminating the need for multiple point-to-point connections between applications. Process Integration– Only by making resources available to every process and user within an enterprise will the full benefit be extracted from computer systems. Unfortunately, the development of department specific systems has encouraged ‘islands of automation’ in many enterprises, where applications become isolated and are available only to a small portion of the enterprise. 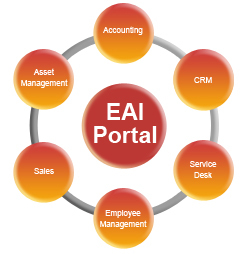 Vendor Independence– EAI solutions are designed to enable the future integration of new applications. By extracting rules and business policies from current data and applications and implementing them in the EAI system, it becomes possible to apply these rules to new applications added in the future with little disruption.